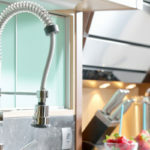 Are you planning to renovate your kitchen DIY style? If so, you’re in luck because we have the top tips for a successful DIY remodel. 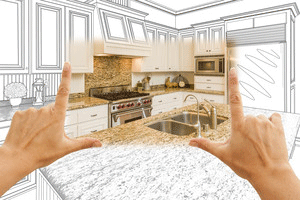 It’s expensive to renovate a kitchen, hence why many people want to go at it alone. 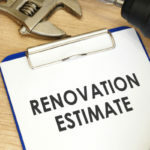 The thing is, unless you have experience creating detailed design plans, as well as installing cabinets, countertops and appliances you probably want to keep your renovations simple or at least hire a little professional help. Here are some DIY-friendly tips to transform your kitchen on a budget. Transform old and outdated counter space, appliances and more using faux steel. You can purchase faux steel online, which can then be sized to any shape appliances or surface. All you need are scissors, a ruler, pencil, squeegee, sharp knife and hairdryer. Using these materials you’ll be able to apply the faux steel to any surface. Before applying the steel, make sure the surface is thoroughly cleaned to prevent the formation of bubbles. The back of the steel contains a peel-away film that will stick to surfaces. You will overlap materials by an inch, then cut away excess materials at the end using your sharp knife. You can transform new or used cabinets into glass-faced cabinets using a drill, sandpaper, glass clip, caulk and a pre-cut slab of glass. If you go to a home improvement store you will be able to order glass that is custom cut to the size you need. You will also be able to pick up the fasteners necessary. Place the cabinet door face down and apply a thin layer of caulk to the edges of the frame, exactly where the glass will rest. Add the glass piece on top and then quickly remove any excess caulking. Once the caulk dries to the glass, you will secure the fasteners to the back of the frame. Use extra caution to ensure they are not visible from the front of the cabinet. Lastly, you attach the cabinet door back to its hinges. If you have some pretty plates on hand you can transform them into a fun and decorative wall for little to no money. Mix and match different plate sizes and designs to create a fun and unique accent piece. Use strong craft glue like E-6000 (Gorilla Glue is not strong enough) to secure paperclips to the back of each plate you plan to use. Next, hang nails in the wall where you want each plate to hang. Once the glue has had time to dry (for the recommended time specified by user instructions) you can hang the plates on the nails in any fashion you prefer. Design tip: try starting in the center and working out from there. Adding hanging lighting to your kitchen makes the space brighter but it also adds style. Hanging fixtures also help to highlight other focal points of your kitchen by drawing the eye to different points throughout the room. If you are starting off with lighting fixtures, all you have to do is purchase an affordable pendant lighting kit. These kits take minutes to apply. Simply roll the cord out to the length you prefer and then attach the cord through the end of your recessed light socket. You then attach the plate so that it sits flush to the ceiling with the bolt, which comes included. Detailed instructions should come included in the kit. Transform an unused or boring wall in your kitchen into a chalkboard by simply buying chalkboard paint for around $12 at the store. Clean and prep the wall as needed and then add the paint. From there you can attach shelving, magnetic boards or whatever else. Use the chalkboard to keep track of important dates, make a calendar or let people what’s being served for dinner. Make sure to dis-attach all cabinet doors from their frame to make the task more manageable. Just don’t forget to label where everything goes so that you don’t have a confusing mess on your hands when you go to put the doors back on. It’s easier to start with the upper corner cabinets and then work down and in from there. Don’t forget to cut holes in the back of the cabinets for water or electrical lines. Secure cabinets using wall studs. Never tighten the screws until you know with certainty that cabinets are plume, level and flush to the wall. Enlist the help of clamps to help secure the cabinets to the wall during installation. 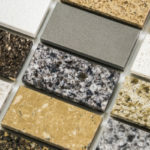 If your kitchen remodel is largely DIY, there’s no reason to pay full resale for cabinets, countertops and other items. Buying wholesale will save you thousands of dollars on the latest styles and materials. 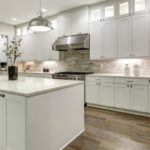 Tops Kitchen Cabinet offers the latest styles in kitchen cabinets, countertops and more for wholesale prices your budget will love.